Providing you the best range of cable fault locator cfl pl3, cable fault locator, cable fault locator cfl pl2, cable fault pin pointer locator, cable fault sim filter locator and dc earth fault locator with effective & timely delivery. Large range of Propagation Velocity from 90 to 300m/μS covers all type of cables including pilot and telecom able with any type of insulation. An ordinary fault locating kit comprising of diagnosis set and pinpointing equipment can take a long time to locate fault point. 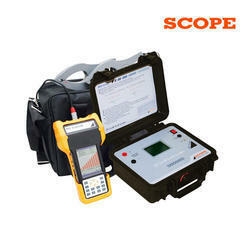 SCOPE offers pre-locator instruments that can give the fault distance to help the operator for reaching the spot quickly and pinpointing the fault in a short time. CFL PL3 is an advanced fault locating instrument. Three operating modes offered by the instrument enable the operator to locate all types of faults on any cable in minimum possible time.Complex and difficult to locate nature fault are located by CFL PL3 with high accuracy. These features classify the instrument to be a part of fault locating kit of Heavy Industries Power Distribution Company. Measuring range up to 16 km. Facility to store compare the waveforms. Housed in rugged, IP class molded case. Propagation Velocity: 90-300m/μs.This range covers all the cables including pilot and telecom cable with any type of insulation. Ranges: 500m, 1km, 4km, 5km, 8km 16km. The operator can choose a right range to get better resolution at fault point. Balance Adjustment: Under TDR mode it is required to balance the instrument resistance to suit the cable under test with this control the instrument resistance can be varied between 5 ohms to 79 ohms. 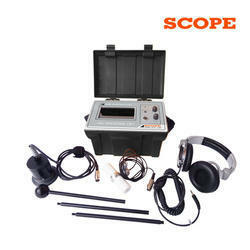 We are offering Cable Fault Locator to our client and we assure satisfaction and quality of the product. Underground cable faults cannot be avoided due to many factors such as road widening, infrastructure improvement, digging carried out for repairs of other underground utilities etc.These faults generally take a long time to detect and hence the long time to repair the damaged cables and restore the power supply. Long outages cause heavy production loss to industries, revenue loss to power distribution companies and inconvenience to general public. 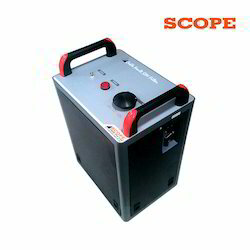 This calls for quick fault location and restoration of power supply in minimum possible time.An ordinary fault locating kit comprising of diagnosis set and pinpointing equipment can take a long time to locate fault point. 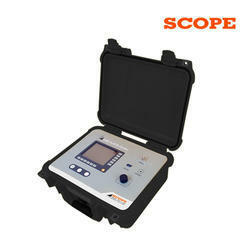 SCOPE offers pre-locator instruments that can give the fault distance to help the operator for reaching the spot quickly and pinpointing the fault in a short time.CFL PL2, new generation Cable Fault Pre-Locator from SCOPE is the ultimate solution for locating underground cable faults in minimum time. It uses advanced technology for fault distance measurement which helps even an unskilled operator to locate the fault with accuracy.The instrument has simple operating modes with which any types of fault on cable can be located with high accuracy. The CFL PL2 is cost effective solution for the job. Propagation Velocity: 90-300m/ μs.This range covers all the cables including pilot and telecom cable with any type of insulation. Ranges : 500m,1km,4km,5km,8km and 16km. The operator can choose the right range to get better resolution at fault point. Balance Adjustment: Under TDR mode it is required to balance the instrument resistance to suit the cable under test. With this control, the instrument resistance can be varied between 5 ohms to 79 ohms. We are offering Cable Fault Pin Pointer Locator to our client. We are offering Cable Fault SIM Filter Locator to our client. 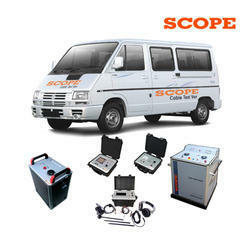 We are offering DC Earth Fault Locator to our client.